What are some examples of “Thinking like a Game Designer”? What are some design rules for games? What are some generic examples of “Fun” ? What are Nicole Lazzaro’s types of fun? Thinking like a game designer. In this section, Professor Werbach tells us that in order to do gamification, we have to think like a game designer. For example, you have to think of users customers, employees, or participants as players. Whatever happens in a game, it happens around the player. These players need to have a sense that everything revolves around them, and also that they can make meaningful choices that have results. Thinking like a game designer means you need to think about ways where players have the freedom to feel they are at play, and that they play for a specific purpose. As a game designer, you have to think about how you are going to entice the players to play your game, as well as how you are going to entice them to continue playing the game. Rule 1 = Onboarding + scaffolding + pathways to mastery. Onboarding: As a game designer you have to get your players into the game as quickly, as easily as possible. Scaffolding: You should reveal the mechanics of your game little by little, so the players learn your game and they don’t get stuck in the complexity. Games give you guides that expressly tell you what you should to do (by highlighting certain elements, for example. During onboarding and scaffolding, games provide feedback that you are doing a good job. There is a limited number of options, so the player doesn’t get lost in the complexity. During onboarding and scaffolding, the game is very easy, you players won’t fail. You should allow your players to eventually reach mastery. Rule 2: Games have to be balanced: Not too hard and not too difficult. Not too few choices, not too many choices, not too easy for one player and too difficult for another player. That’s is why testing your game with real players is crucial. Rule 3: As a designer of gamified systems, you need to create an experience. This means you have to take something that is not game-like and make it feel game like. People Fun: The fun of interacting with others. 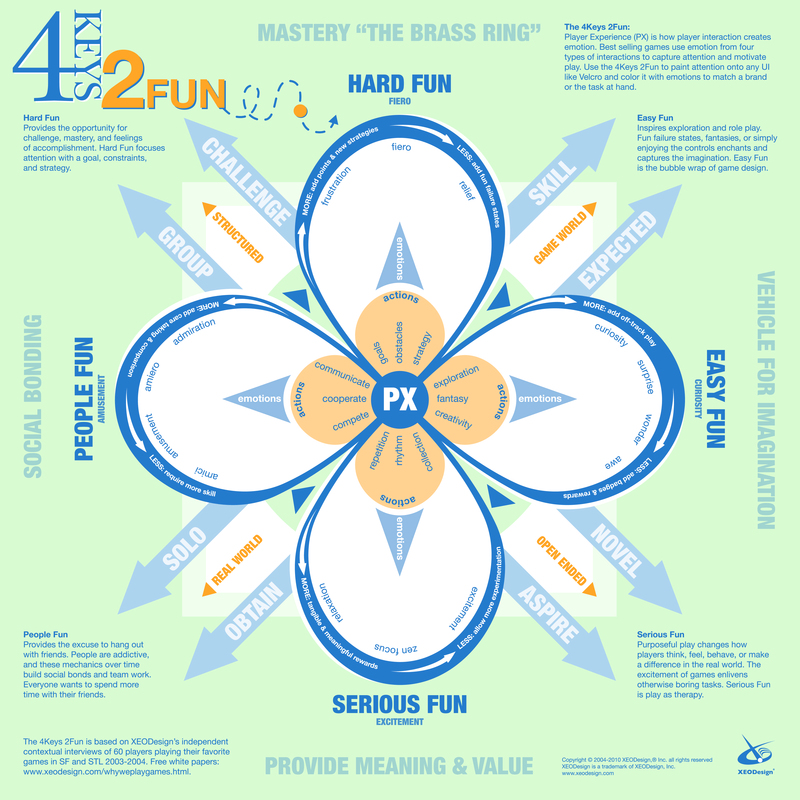 Serious fun: Fun that provides meaning and value. Gamification is about finding the fun, finding the game-like aspects and create an environment that moves people toward an objective through fun. After this section, you will answer the following questions. What are some elements shared by all games? What are the 3 parts of Professor Werbach’s framework? They are specific ways to do the higher level things that the dynamics and mechanics represent. This is not a universal comprehensive list, but there are some options you can use if you want to implement a gamified system. In which ways are points useful? In which ways are badges useful? In which ways are leaderboards useful. The most common elements found in implementations of gamification are Points, Badges and Leaderboards. Points help us keep score, show the relative position of players related to each other, and can help us define who wins the game. Points also provide feedback to the player on how well they are doing. They are the universal currency within games. Badges are representations of achievement and help the game designer motivate the player in the right direction. They signal things that are significant and they also function as credentials, to show other people what the player has done. Badges also support collections, which is in itself a game mechanic that pushes people to play and to be more engaged. Problem: If a player’s score is, say, 500, and he sees that the person at the top of the leaderboard has 700,000, then they might feel that they are mad at the game and get demotivated. Solution: Use a personalized leaderboard that puts the player in the middle, showing you some people above you and some people below you. You can also do a personal leaderboard that shows only the friends of the player. Elements (such as points, badges and leaderboards) are not sufficient; they are just a starting point. If there is a too heavy focus on game elements, especially the PBL trial, there is a risk to overemphasize rewards, which can actually diminish motivation (More on human motivation later). It is recommended by Professor Werbach that the game designer makes sure that there is a pathway to mastery , to competence.